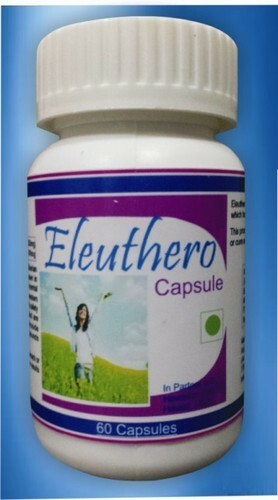 Eleuthero Capsules is an excellent product formulated and designed by Sivam Health Care, an ISO 9001:2008 certified company in partner with Hawaiian Herbals located in Hawaii, USA. This is a HALAL & KOSHER certified product & produced under International GMP regulations. It containsEleuthero sinensis popularly known as Siberian Ginseng is a powerful adaptogenic herb. It has been carrying a plenty of benefits in eastern medicine for thousands of years enjoying a history of both safety and effectiveness. The Eleuthero root used in this product is carefully selected based on high eleutheroside concentration, the plants active therapeutic compoundsdelivering maximum effectiveness. Natural Herbs is an ISO 9001:2008 certified company & is headquartered in Chandigargh, India. Currently we are having tie ups with more than 10 International companies & we are serving in more than 100 cities across 25 states in India in a full range of products. Our marketing team comprises of about 100 plus independent sales agents. Our infrastructure, skills and resources are at par with the best in the world.